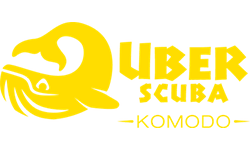 Affordable Quality for your Komodo Diving Trip. If you have only enough time for a quick visit to Komodo, then this is the activity for you! 3 dives to the beautiful Komodo National Park – With this option you will go out in the morning, enjoy the dives and return the same evening to Labuan Bajo – accommodation is not provided, nor are Komodo National Park entrance fees. All equipment, guiding fee’s, lunch, snacks and refreshments are included. This price is for certified divers, if you are not already certified then please see our Scuba Courses section. Do you want to combine Diving with Dragons? Let us take you for 2 Dives and a Komodo Dragon Walk on Rinca Island. Please note, we do not schedule this activity every day and it is dependant on our schedule – please email us to determine availability. With this option you will go out in the morning, enjoy the dives and return the same evening to Labuan Bajo – accommodation is not provided, nor are Komodo National Park entrance fees. All equipment, guiding fee’s, lunch, snacks and refreshments are included. Don’t forget your camera! This price is for certified divers, if you are not already certified then please see our Scuba Courses section and you can combine Discover Scuba Diving with this tour (unfortunately we cannot combine Dragon Walks with the Open Water Course). Want to dive the highlights of Komodo and have a little longer, book our most popular package ‘Into the Blue’ for 6 dives or 5 dives plus a Dragon Trek across 2 days of your choice. With this option you will go out each morning, enjoy the dives and return each evening to Labuan Bajo – accommodation is not provided, nor are Komodo National Park entrance fees. All equipment, guiding fee’s, lunch, snacks and refreshments are included. This price is for certified divers and a 5% discount has been applied to our daily dive price, if you are not already certified then please see our Scuba Courses section. Are Manta Rays on the top of your to see list? Our Komodo Dive Package of 4 days and 12 dives gives you ample time to spot these majestic rays and if you would like to, you can substitute a dive to see the Komodo Dragons on Rinca Island.With this option you will go out each morning, enjoy the dives and return each evening to Labuan Bajo – accommodation is not provided, nor are Komodo National Park entrance fees. All equipment, guiding fee’s, lunch, snacks and refreshments are included. This price is for certified divers and a 10% discount has been applied to our daily dive price, if you are not already certified then please see our Scuba Courses section. Does your diving addiction need more Vitamin Sea? Our Komodo Dive Package of 6 days and 18 dives gives you the opportunity to explore the main dive sites in Komodo in every tide, with Uber Scuba by your side. With this option you will go out each morning, enjoy the dives and return each evening to Labuan Bajo – accommodation is not provided, nor are Komodo National Park entrance fees. All equipment, guiding fees, lunch, snacks and refreshments are included. This price is for certified divers and a 15% discount has been applied to our daily dive price, if you are not already certified then please see our Scuba Courses section. Safari Trips are our multiple night liveaboard (live on board) options and we offer 3, 4, 5 and 6 night options depending on the schedule. With these trips scuba diving, accommodation and full board meals are included. Please note, we do not offer 1 or 2 night trips. See our Liveaboard Page for more information about scheduled dates, prices and cabins. Via our insurance partner InDepths.com – we can offer you the benefit of purchasing daily dive insurance for the days that you are diving with Uber Scuba! There are special rates for weekly, monthly and yearly scuba insurance too – please ask us for details. Please note, if joining for our liveaboard experience, dive insurance is a mandatory requirement in joining a cruise. You may either use your own provider or sign up to InDepths with us upon arrival. Discover Scuba Diving with us on this 2 dive day trip into Komodo National Park. Perfect for beginners or those uncertified divers on a time frame as we learn basic scuba theory, practice confined water skills and dive to maximum of 12 meters depth. Already an Open Water diver with PADI / SSI / CMAS / NAUI or BSAC? Great news, now you can take your SSI Advanced Adventurer certification with Uber Scuba. Do not worry, you can easily go from Open Water Diver with one of the above mentioned agencies to the SSI Advanced Adventurer certification and even onto the PADI Rescue Diver or equivalent as the agencies recognise each other. On this 2 day course you will enjoy 6 dives. Of these, 5 x dives are course based Adventure Dives – the three mandatory at Uber Scuba are Deep, Navigation and Perfect Buoyancy; and you can choose two more from Waves, Tides & Currents, Computer, Fish Identification, Boat Diver or Equipment Techniques. Adventure Dives are the first dive of a speciality course and a great introduction into gaining you a more diverse set of diving skills. On this course, we go deeper (30m) and teach you to feel more comfortable in the underwater world. The best part is that the theory is led by the instructor so there are no heavy text books to read or carry! The last 1 x dive can either be a fun dive or, subject to availability, a Dragon tour of Rinca. Contact us for more information. The Stress & Rescue course is only offered as to those joining us on a Divemaster training course, and an additional fee is incurred. We do not offer this course as a stand alone option. Please contact us for more information. Go Pro in Komodo with Uber Scuba on this 6 week program. Join our day trip operation and enter into the professional world of recreational scuba diving. Enjoy diving and learn guiding in Komodo, you will be turned in a perfect Divemaster. The listed price is with Full own Diving Equipment. Please contact us for more information. Choose from Deep / Perfect Buoyancy / Waves, Tides & Currents / Computer / Navigation / Fish Identification / Boat Diver or Equipment Techniques – this counts towards 1 of your 5 Adventure Dives needed to gain your SSI Advanced Adventurer Certification. Haven’t dove in more than 1 year? Refresh your skills with this add on experience. We will review dive theory, equipment techniques, confined water training and get reacquainted with the underwater world. This add on will ensure a more comfortable experience for those divers who haven’t entered the water for some time. We combine this experience with 3 dives into the Komodo National Park. Perhaps you enjoyed a Discover Scuba Diving experience with us and want to dive more without getting the Open Water License? A repeat intro is for you. Maximum 12m depth with an instructor as your buddy. Add this extra onto the discover scuba dive experience. The Emergency First Responder (EFR) certificate is an add on to the Stress & Rescue course. If you have no previous or out of date EFR certificate then this one day course is perfect for you. Via our insurance partner InDepths.com – we can offer you the benefit of purchasing daily dive insurance for the days that you are diving with Uber Scuba! There are special rates for weekly, monthly and yearly scuba insurance too – please ask us for details. Please note, if joining for our liveaboard experience, dive insurance is a mandatory requirement in joining a cruise. 3 snorkelling spots in the Komodo National Park – perfect only for friends of scuba divers who want to accompany their friend or partner. Join us for a day of snorkelling in the Komodo National Park as we take you to 2 snorkelling sites plus a Komodo Dragon Trek. Itinerary dependent on the diving day – perfect only for friends of scuba divers who want to accompany their friend or partner.